One way to usher in the New Year is with this Cointreau spiked French toast. The French bread is soaked overnight in a mixture of eggs, orange juice, the orange liqueur, cinnamon, sugar and vanilla. It can be topped with powdered sugar and an orange infused maple syrup. We enjoyed this Christmas morning, but it would be perfect for New Year’s Day. The recipe came from one of my childhood friends. I have mentioned before that a group of my high school friends and I self-published a cookbook of our favorite recipes. Norma had spent many years as a caterer and this was one of the breakfast dishes that she liked to serve. It is very easy to assemble for a crowd once the initial soaking is finished; just brown and serve. Serve with Champagne and orange juice for a celebration of the new year. I offer you love and hope for 2018. Slice bread into 1-inch thick slices. Lay bread in jelly roll pan. Pour next 7 ingredients that have been whipped together, over the bread and refrigerate overnight. Turn griddle on medium and heat up. Lightly butter griddle, lay bread on griddle and cook for 5 minutes on each side. You can finish cooking if need be in the oven at 325 degrees. In a saucepan, mix together the maple syrup, orange juice concentrate, and vanilla. Cook mixture for 15 minutes. Sprinkle french toast with powdered sugar and pour sauce over it. 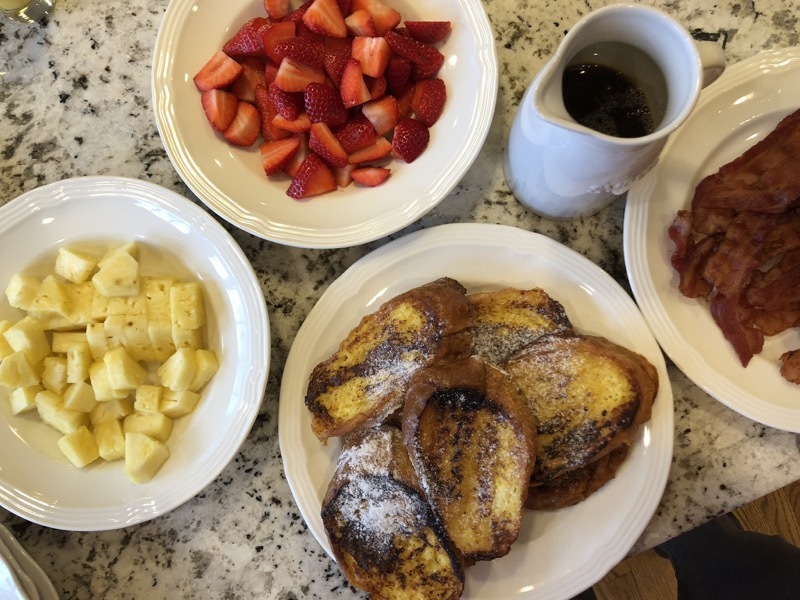 I love French toast and this recipe sounds great. Happy New Year Penny! Happy New Year to you too Penny! Looking forward to our Spring fling! 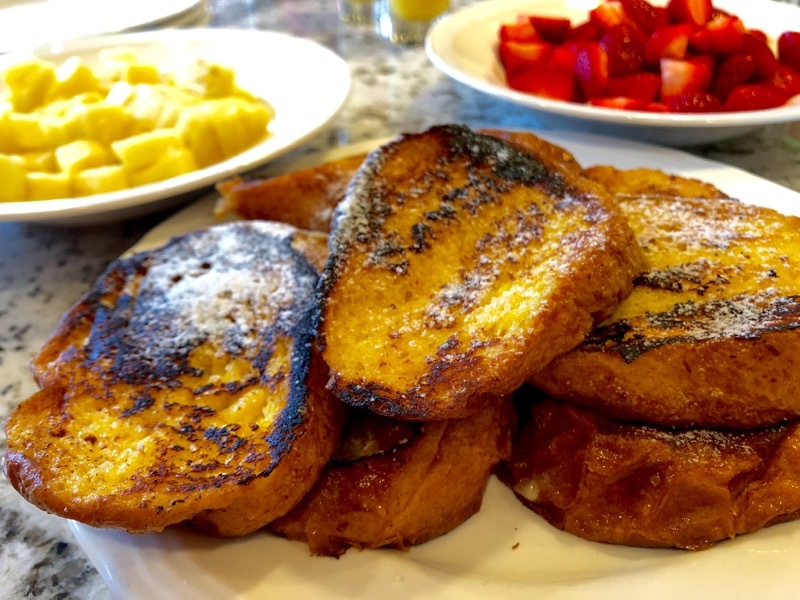 Love French toast but it must be served with powdered sugar and yours is. Wishing you all the best in the New Year. Wishing you are fabulous 2018 Karen. Stay warm. Seems it is even cold in Florida. You must try this Madonna. Happy New Year! Hppy New Year Penny et famille..I should indulge in FT more:)Life is short..eat dessert first they they! We only indulge occasionally Monique, but it is worth it. Happy New Year. Hope you stay warm inside with the frigid temps outside. 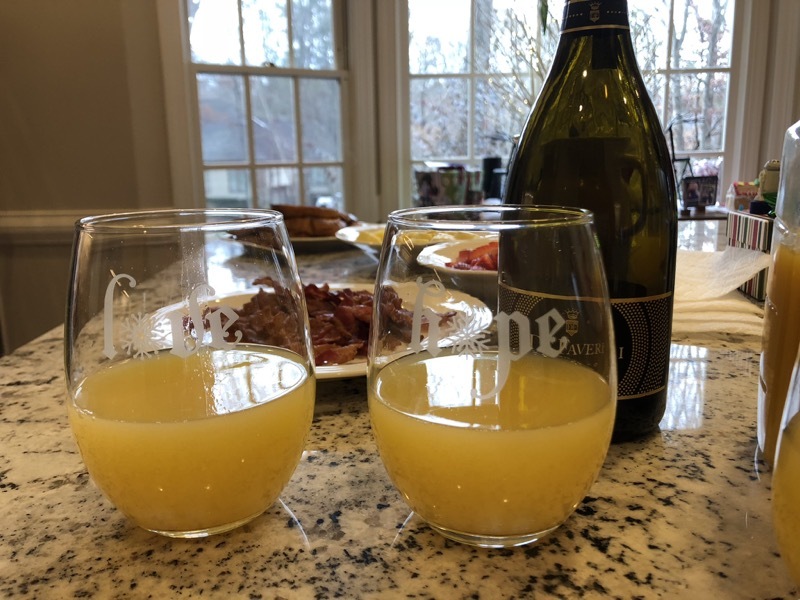 Yumm…enjoyed seeing you and David on Christmas & looking forward to seeing you in Florida in a few weeks. Wishing you many blessings in 2018! Looking forward to seeing you in Florida Darla. Hope it warms up. It is supposed to snow in Charleston over New Years. Wow…it was supposed to snow today in Emerald Isle, but it is 45 and sunny…positively balmy after a morning low of 24! The extended forecast for mid-Jan shows milder temps in FL and NC. This post was published by Penny on December 28, 2017.